Squadron Leader Jayasimha, the President World Memory Sports Council for India is very pleased to announce that as of today 165 Memory athletes have registered for the Championship. 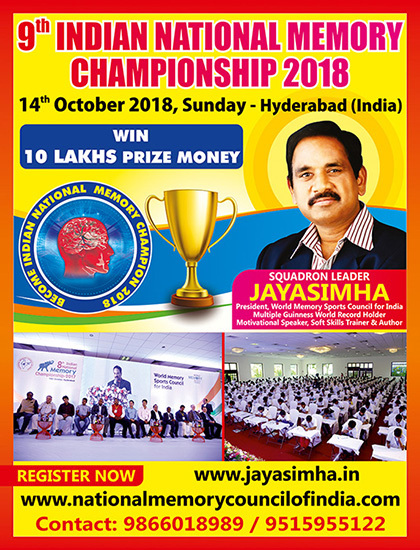 Other interested people may register for the Championship by visiting ww.jayasimha.in or ww.nationalmemorycouncilofindia.com or mail to visionjay@gmail.com or you may contact Squadron Leader Jayasimha on 98660 18989. For any training assistance, please contact Jayasimha Mind Education, Hyderabad on 9515955122.